Radiotherapy, commonly used to refer to radiation therapy, is a form of cancer treatment. It is used for the treatment of certain other conditions as well, including the presence of non-cancerous growths, blood disorder and diseases related to the thyroid gland. How much does radiation therapy cost in India? Cost of radiation therapy in India depends on several factors. The cost of three-dimensional conformal radiation therapy (DCRT), stereotactic body radiation therapy (SBRT) and intensity-modulated radiation therapy (IMRT) lies between $800 and $1500 per cycle of treatment. It is estimated that 40 percent of the cancer patients are prescribed radiation therapy during the course of their treatment. This includes the patients who are advised to undergo both the forms of radiation therapy – external radiation and internal radiation. India is a popular destination for cancer treatment, especially chemotherapy and radiation treatment. This is because the cost of radiotherapy in India is much less than other popular countries and medical tourism hubs, despite the fact that the quality of medical treatment in India is at par with any other country in the world. This is the reason why thousands of cancer patients travel to India to seek radiotherapy, chemotherapy and surgical options for the treatment of their cancer. The best hospitals for cancer treatment in India have the latest machinery and technology used to conduct radiation therapy, both internal and external. 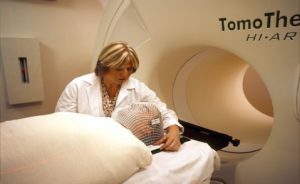 How does radiation therapy help treat cancer? 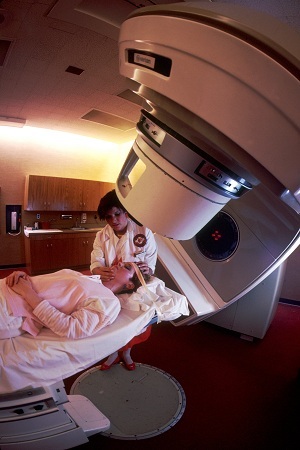 Radiotherapy derives its name from radiation, which is the backbone of this form of treatment. Radiation, mostly X-ray, is used to kill cancer cells. This treatment has been in use for investigational and treatment purposes for many years. Radiotherapy works by damaging the DNA of the cancer cells, which ultimately kills them or stops them from multiplying any further. One of the biggest radiotherapy side effects is that the radiation damages the DNA of some of the normal cells as well, but a majority of them are able to repair themselves automatically over a period of time. External radiation therapy: This type of radiotherapy makes use of X-rays derived from a linear accelerator, protons or electrons to damage the DNA of the cancer cells. Multiple external radiotherapy sessions are required to see effective results. Internal radiation therapy: This approach involves the use of a radioactive material contained in a liquid or an implant. The liquid is consumed by the patient directly, while the implant is placed at the site of cancer. The radioactive material is slowly released and it then attacks the cancer cells internally. What are the best hospitals for radiosurgery in India? The cost of radiation therapy in India depends on several factors. Still, the overall cost of cancer treatment in India remains cheaper than a majority of the other countries. The best hospitals for cancer treatment in India are equipped with the latest technology and house some of the best oncologists who strives to deliver the greatest care and medical services. The cost of three-dimensional conformal radiation therapy (DCRT), stereotactic body radiation therapy (SBRT) and intensity-modulated radiation therapy (IMRT) lies between $800 and $1500 per cycle of treatment. The extent of cancer: The cost of radiotherapy depends on the type and extent of cancer that the patient is suffering from. Cancer that has spread to different tissues and organs required the high dose of radiation and multiple sessions, and thus, greater the cost of treatment. Treatment method: The cost of external radiation therapy is different from internal radiation therapy. While the former involves the use of X-rays, the latter is a sensitive procedure that may even involve placement of a radioactive implant inside the body of the patient. Thus, there is different in their cost. In addition, the cost also depends on the type of technology used to deliver external radiation. Anaesthesia charges: The type and dosage of anaesthesia, if used, during the treatment also determines the overall cost of radiation therapy treatment. The cost of anaesthesia in hospitals is typically higher, thus, the cost of treatment is higher in the case of hospitals than doctor’s clinic. Secondary procedures: Radiotherapy is sometimes accompanied with secondary procedures used to treat cancer or any other underlying condition. Thus, the overall cost of radiation therapy may depend on whether additional procedures are also carried out. The number of sessions: Typically, advanced stage cancer patients required to undergo multiple radiation therapy sessions. This is because all cancer cells cannot be killed in a single session. In addition, multiple sessions are required in cases wherein the patient is not able to bear high dose radiation. In such cases, several low dose radiation therapy sessions are conducted for treatment to remain as effective as high radiation session. Required dosage: Some forms of cancers must be treated with high dose of radiation. The greater the dose of radiation, the greater is the cost. High dosage is also required in case cancer has spread extensively. Type of medical facility: The cost of radiotherapy in India also depends on the medical facility that you approach. For example, patients incur fewer expenses when they get treated at doctor’s clinic or office, and more when they approach a hospital. Type of hospital: The cost of radiation therapy in India is less in government run and other public hospitals. On the other hand, the treatment is expensive in private hospitals. Duration of hospital stays: In the case of radiotherapy is accompanies with a second procedure or chemotherapy, then an overnight stay is required at the hospital. This, in turn, has a direct impact on the total radiation therapy cost.